Although John E. Guy, 21, possesses a commercial driver's license, he has twice been convicted of driving to endanger, most recently in 2016, Maine driving records show. The 21-year-old man who was behind the wheel of a Kittery Recreation Department van carrying 11 children that crashed Friday in New Hampshire has twice been convicted of driving to endanger, Maine state driving records show. John E. Guy, who has a Class A commercial driver’s license, was convicted of the first offense – apparently through the Bureau of Motor Vehicles administrative process – in August 2013 when he was 16 years old and less than a month after his license was issued. The second conviction came in August 2016. His record also includes two speeding tickets – one for driving 45 mph in a 35-mph zone and another for driving 62 mph in a 40-mph zone – and three convictions for driving with a suspended license, along with two instances of failing to show a valid inspection sticker. Guy also has two criminal convictions in Maine for violating the conditions of his release, the first in March 2018 and the second in May 2018. He was fined $200 each time, according to the State Bureau of Identification. Details of those offenses were not available Sunday. Guy has been placed on leave from his position with the town pending the outcome of an investigation, Kittery Town Manager Kendra Amaral said Sunday. It was unclear Sunday whether the town of Kittery checked Guy’s driving record before hiring him for a position that includes transportation responsibilities for children. New Hampshire State Police said Guy had a medical emergency immediately before the 2010 GMC Savana transport van carrying 12 other people left Interstate 95 and crashed into the tree line in Greenland, New Hamphshire, about 9:20 a.m. Friday. New Hampshire State Police Trooper Andrew Wilensky said the precise cause of the crash is still under investigation, and in an email Sunday he declined to specify what type of medical emergency Guy suffered. Everyone who was injured in the crash has been released from treatment at area hospitals, including one child who was transported to a Boston hospital with serious injuries, Amaral said. Amaral said she has given consent for police to download the contents the van’s crash computer, which stores and preserves vital information about a vehicle in the seconds leading up to and after a crash. Depending on what information is stored in the device, it could help police pin down facts such as whether the brakes were applied before the wreck or if parts of the vehicle malfunctioned. Attempts to reach Guy – whose last known address was in Kittery – and his family were unsuccessful Sunday. Amaral said in the statement Sunday evening that she learned that Guy’s father had previously served on the Kittery Town Council, although she did not know when or for how long. After Friday’s crash, the others in the van, including Guy, were taken to hospitals in Exeter or Portsmouth, New Hampshire. With the one exception, the children’s injuries were not serious and all were home with their parents by the end of the day Friday. The bus was carrying 11 children between the ages of 7 and 9, along with Guy and another counselor. The children were part of a summer program operated by the Kittery Recreation Department and were on a field trip to the Candia Springs Adventure Park, a water park in Candia, New Hampshire, police said. 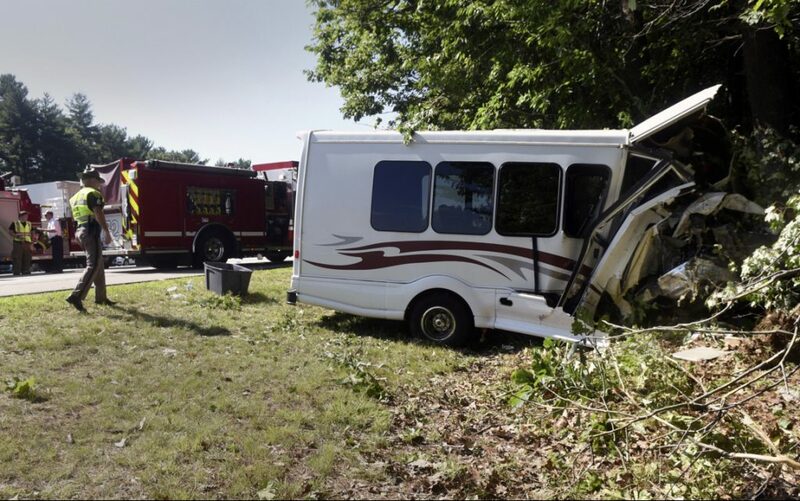 The van was behind two buses that were also taking children from Kittery to the water park. The buses continued on to Candia, their drivers apparently unaware of the crash, police said. Unless a vehicle is rated to carry 16 passengers or more, including the driver, no commercial driver’s license is required in Maine. The classification of commercial driving license that Guy possesses means he is qualified to drive vehicles that weigh more than 26,001 pounds, or tow a trailer heavier than 10,000 pounds. Maine also permits special endorsements for certain types of vehicles, such as school buses. There was no indication that Guy’s commercial driver’s license carries any of those additional credentials. The Kittery summer camp, which runs for a nine-week session, is part of Kittery’s SAFE – or Safe Alternatives for Enrichment – program. For a full summer, the camp costs $1,350; the weekly rate is $175. That includes regular outings involving transportation. Amaral said the camp still plans to conduct scheduled field trips in the coming weeks, but will exclusively use a contractor for transportation. Upcoming trips include Kingston State Park in New Hampshire and Funtown in Saco.